Actor's Youth Theatre is incredibly thrilled to introduce our Summer 2019 at AYT!! Registration: $195/per camp including a camp t-shirt! Register before April 15th and receive TWO free tickets to the final performance of your students' camp!! Camps will fill quickly so SIGN UP WHILE YOU CAN!! Register for 8 Private Lessons to use through the months of June and July for only $200, now through the end of April!! This promotion will only be valid to use through the month of April 2019! 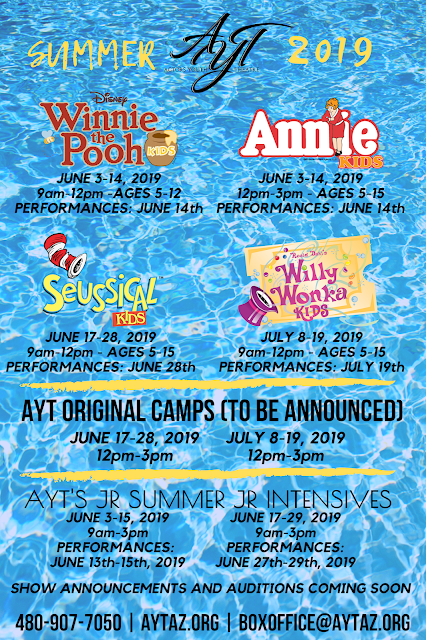 We are so excited to announce that we will also be doing TWO JR show intensives this summer, as well as our normal premiere summer intensive in July! Auditions will be posted soon for those, so stay on the lookout for those, as well as more info on summer classes, workshops and dance intensives!